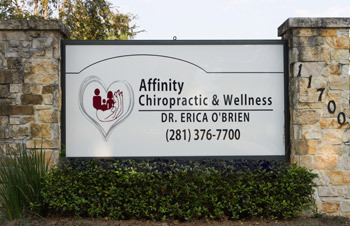 Chiropractor in Northwest Houston, Dr. Erica O'Brien began her adventure at Affinity Chiropractic & Wellness in September of 2008, just after Hurricane Ike hit Houston! Due to power outage from the storm, the first two weeks in the office were interesting, to say the least. Affinity Chiropractic & Wellness has been making a difference for over 20 years. O'Brien worked under the direction of Dr. Karen Wilson, the previous owner of Affinity Chiropractic & Wellness, for exactly one year, before assuming responsibility as the practice owner. Dr. Wilson established her practice in 1980, so she was exactly the type of doctor O'Brien wanted to shadow before becoming her own boss. Affinity Chiropractic & Wellness has been at its present location since 2002. Dr. Sara Riley joined the practice in September 2011, due to growth of the practice and a high demand for chiropractic care! It is our goal and job at Affinity Chiropractic & Wellness to get patients moving better and feeling better, so that their quality of life is improved! We strive to add years to your life, and life to your years! We have a variety of treatment options available, so we're able to tailor a personalized course of treatment for each patient. We have convenient, easy hours, we work with most major medical insurance companies and Medicare, we have reasonable self-pay prices, and we have two doctors (remember, two heads are better than one)! Here at Affinity Chiropractic & Wellness, we've all been chiropractic patients at some point or another! Feel free to ask us about our chiropractic experiences, from the patient perspective. Give us a call at our Northwest Houston chiropractic office to get started with chiropractic care today!